There is no typical volunteer, there is no one volunteer like another, but they do have one thing in common – an interest in their community and desire to make a difference. The Highlands Ranch Metro District is lucky to have had 1,413 volunteers in 2018. 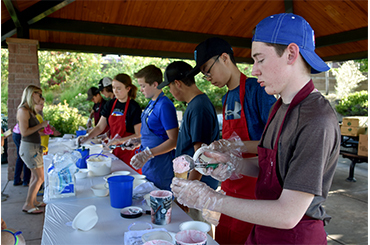 These individuals have contributed time in a variety of areas including coaching youth sports, greeting guests at the Highlands Ranch Mansion, planting a tree, serving ice cream at a community event and more. Families, students, retirees – these are some of the faces of Highlands Ranch volunteers. Thank you for giving your time and energy and we look forward to working with you in 2019. To learn more about volunteering with the Highlands Ranch Metro District, click here.